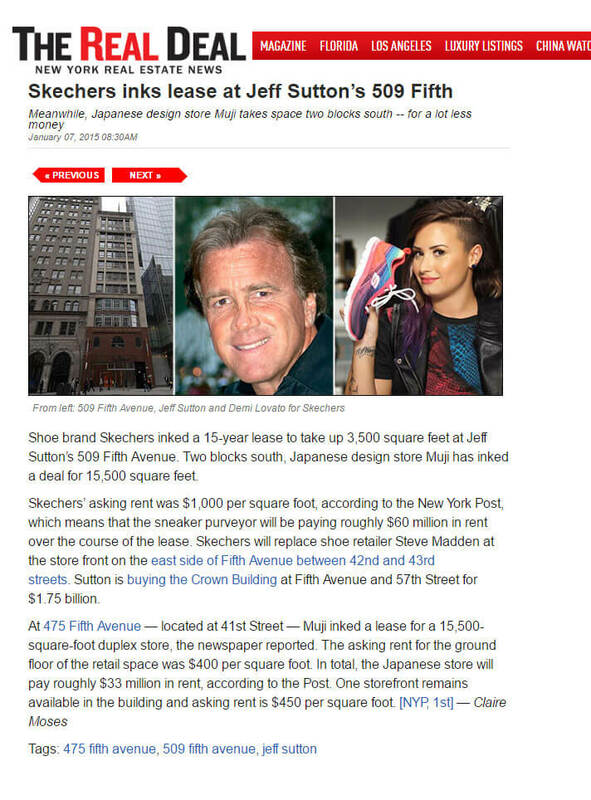 Shoe brand Skechers inked a 15-year lease to take up 3,500 square feet at Jeff Sutton’s 509 Fifth Avenue. Two blocks south, Japanese design store Muji has inked a deal for 15,500 square feet. Skechers’ asking rent was $1,000 per square foot, according to the New York Post, which means that the sneaker purveyor will be paying roughly $60 million in rent over the course of the lease. Skechers will replace shoe retailer Steve Madden at the store front on the east side of Fifth Avenue between 42nd and 43rd streets. Sutton is buying the Crown Building at Fifth Avenue and 57th Street for $1.75 billion.